I bet all of you saw the video of Bill Nye slamming the belief in creationism. He accuses opponents of evolution of holding back society and teaching inappropriate material to children. Listen for yourself. Ken Ham, the president of Answers in Genesis offers a rebuttal to Bill Nye. Here are some creation scientists pointing out some glaring flaws with Bill Nye’s position. I hope you can think critically about the presuppositions behind the science you hold. Does it really correspond with reality? I hope these videos made you think. 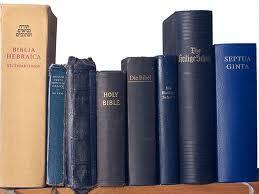 Here is a very interesting read concerning Bible translations. If you are concerned with the reliability of the Word of God and how it has come to us then you have dealt some of these specific questions. Click the link and read in detail about this interesting (and important) topic, written by Dan Wallace, a premiere Greek Scholar and translator. Need Real Life Peace? 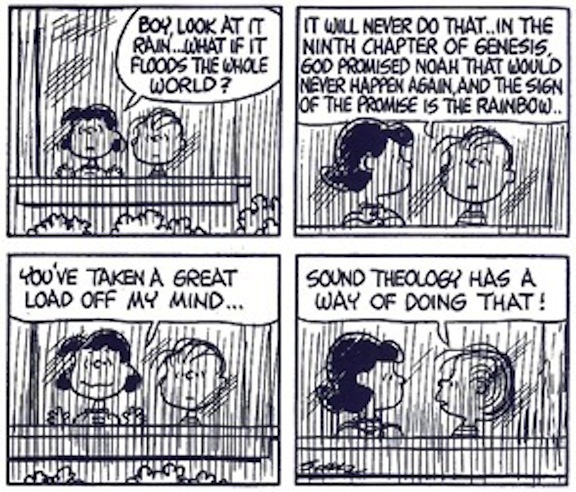 Focus on Sound Theology. These days we are flooded with the experiential and relational aspects of our faith. While we need to experience God and have an emotional connection as He moves, where is the bedrock for understanding how to relate to God? The foundation is not rooted in emotional response. It is not rooted in ourselves at all. Correct relation to God is based in a sound biblical theology. We allow God to tell us through His Word how we connect with Him. Therefore, when resting in a sound theology of God’s love and interaction with His creation we can find peace for real life. We are not stranded, fighting for ourselves. We have one who fights for us. Sound theology directly influences our real lives. Check out the Peanuts comic strip that sees this connection when many people go though life and miss it. Here is a fantastic article focused on a glaring deficiency among pastors, and really all believers. We can get so fixed on running “my race” for God in the day to day grind that we forget there is a biblical mandate to guide the next generation into maturity. If we don’t do it who will? Writing for DesiringGod.org, Mike Bullmore posts “Brothers, Train Up the Next Generation” as a reminder to this very fact. Check out the article to get a great perspective of the need and solution. Disciple Faithful Men: Paul is used as a rubric here. Do you have a Timothy? Avoid Temporal Shortsightedness: it is easy to think only about the here and now, but the coming glory is always a key element in biblical living. 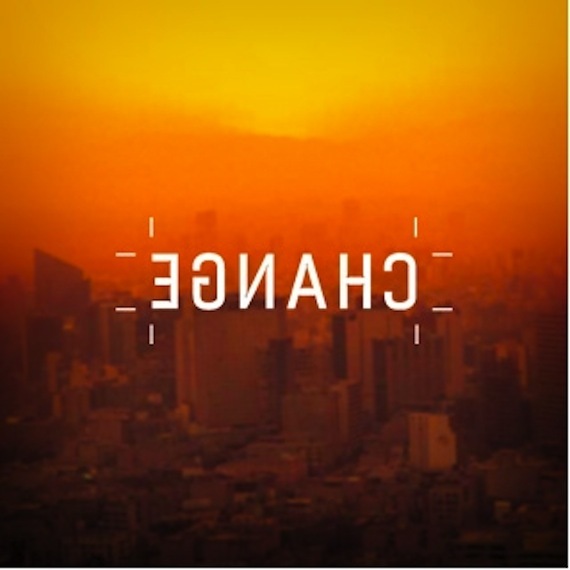 Cultivate a Far-seeing Vision: Contrast Hezekiah with Paul. It take intentionality and devotion, but it is our responsibility. Invest in the Next Gospel Generation: 1) be personally devoted to Gospel ministry, 2) Notice those who rise to the top, 3) create context for youth to “practice” handling the Word, 4) Pray intentionally for God to raise up passionate hearts, pray for your replacement. Here are 10 key areas of creation every Christian must know to be well informed and able to speak clearly about hot issues related to the beginnings of life. These links provide support for a biblical understanding of the most current scientific research to the more popular questions in society. So take a look and be informed! Chapter 8: Did Humans Really Evolve from Apelike Creatures? Thank you AiG for great stuff all the time! You are helping christians around the world understand that believing the bible not not mean you have to check your brain out at the door! Dr. Greg Thornbury, one of the most influential professors I had while attending Union University, has written a blog posted HERE, available through BibleMesh.com, addressing the Biblical illiteracy of our culture. While we have everything from game shows (The American Bible Challenge: with host Jeff Foxworthy) to books aimed at bible-knowledge, how well are we really doing? Are we training the next generation to understand the Bible in a way that, as Thornbury says, “everything points to the message and mission of the Lord Jesus Christ”, or are we just teaching trivial moral facts? Read and be challenged! For more than two decades now, American society has been fixated on our ignorance about things, often to the point of celebration. In 1991, the very first For Dummies book (it was on DOS) rolled off the presses, and more than 1600 of the series have been published since then. We’re not afraid to say when we don’t know stuff, and actually to do so is kind of therapeutic. Sometimes, the dummy culture rises to the level of comedy, and one thing we find hilarious is our collective cluelessness about the Bible. Years ago, Tonight Show host Jay Leno poked fun every so often at the pandemic ignorance of Holy Writ during his “Jaywalking” segment. Biblical illiteracy is, however, no laughing matter. Recent titles such as Timothy Beal’s The Rise and Fall of the Bible and Kenda Creasy Dean’s Almost Christian show that the problem for the Church is pandemic. Both books demonstrate the appalling state of how little believers know about their own sacred text. 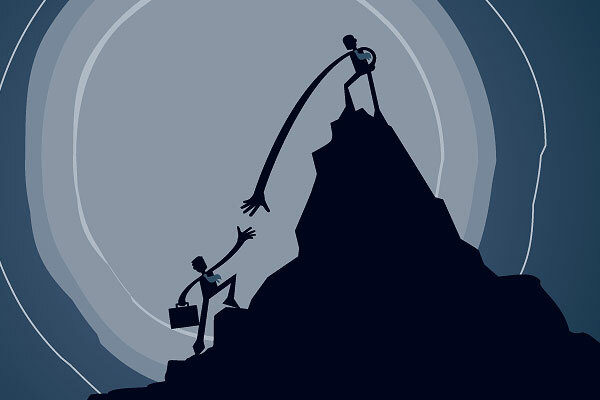 How long can any organization survive if its members don’t know its mission, axioms, and core beliefs? Well, that’s a rhetorical question. But what if people actually did know their Bibles? Esquire writer A.J. Jacobs took up that challenge and tried to combine humor with astonishing levels of biblical literacy in his irreverent book, The Year of Living Biblically. In it, Jacobs, an admitted agnostic, seeks to live an entire year by trying to obey the commands of the Bible as literally as he possibly could in modern day Manhattan. He found it rough going for multiple reasons, chief amongst them not being able to gossip at work, lie, or covet the possessions of others. Rules such as stoning adulterers, slaughtering oxen, wearing clothing not made of mixed fibers, and not shaving one’s beard seemed even harder to apply to modern life. In the end, Jacobs concludes we can’t read the Bible literally, and that in reality people just pick and choose the commands they like, and ignore the ones that they don’t. What do all of these books, shows, and analyses have in common? They reveal that we live in a culture that can’t live with the Bible, but also can’t seem to live without it. At the bottom line, however, here’s the truth: the Bible is a confusing and even bizarre book. But it is only that way if it is not read through the lenses of what the 16th century Reformer John Calvin called the “spectacles of faith” – where everything points to the message and mission of the Lord Jesus Christ. Try to turn the Bible into a disconnected series of facts, and you might have a quiz show. Try to squeeze the law of Moses into modern society and you get a Kafka-esque nightmare or a funny Jacobs’ book. Read the Bible without the grace and love of Jesus to explain all that has gone before? How many ways can you spell disaster? To receive a free packet of 1000 Lifebooks only requires an online registration and a (suggested no-mimimum) love offering. Our student ministry has organized and participated in a “saturation” in the past and I fully recommend yours doing the same. What is more effective than getting God’s Word in the hands of teenagers in your area? By handing out these compact little books, your students become “gift-givers” rather than preachers or intrusive as they learn to share their faith. Here is specific link for Youth Leaders with quick video describing how to get involved. Isaiah 55:10-11 speaks of how God’s Word is always effective. What an awesome promise! Check out the informative video below and see if you want to get plugged in! What Do Christian Teenagers Believe about Jesus? Biola Magazine has done some research and produced this thought provoking article on the nuts and bolts behind the faith of the current generation of teenagers. We need to get specific about Jesus Christ and faithfully teach what the bible reveals. This generation is floundering in a vague divinity and spineless teaching when all along a strong clear picture of Jesus is on display in the pages of scripture. WIll we believe it? WIll we pass this on. 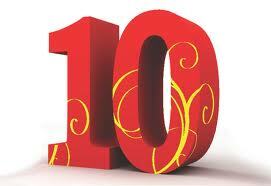 Check out the below article and gain insight into the faith of this generation of teenagers. What does the faith of the next generation of Christians look like? When we examine the actual beliefs of Christian teenagers regarding Jesus and his meaning for our lives, is what we find encouraging or alarming? 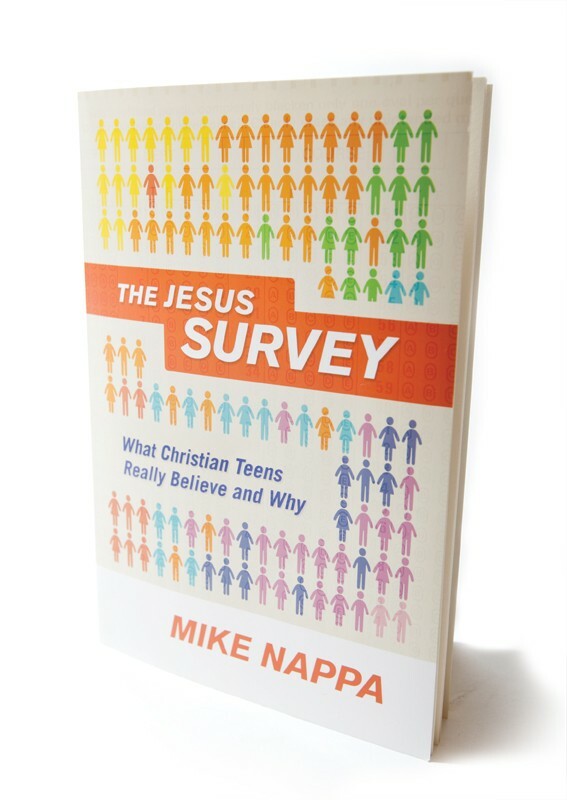 In The Jesus Survey (Baker Books, 2012), bestselling author Mike Nappa (’89) explores these questions by presenting the results of a nationwide survey of Christian teens. Here, Nappa discusses some of his findings with Biola Magazine and talks about the takeaways for parents, teachers, youth pastors and anyone invested in the faith of future generations. Mike, could you briefly describe the types of Christian teens that you surveyed and the survey methodology? What was the overall goal with “The Jesus Survey”? What did you want to find out? The original goal was just to satisfy my own curiosity! I wanted to discover what Christian teens believed about Jesus — and how that was (or wasn’t) affecting their everyday lives. So I asked them. In terms of the specific survey, the first part was designed to measure what teens thought about four core doctrines of Christ: 1) The Bible is completely trustworthy in what it says about Jesus. 2) Jesus is God. 3) Jesus physically lived, died and came back to life. 4) Jesus is the only way to heaven. Having established those baselines, the second part of the survey was designed to measure how a Christian teen’s belief or unbelief in those core doctrines affected his or her daily experience with God. While 86 percent of those surveyed reported that they viewed the Bible as at least somewhat trustworthy, 70 percent expressed persistent, measurable doubts that what the Bible says about Jesus is true. And these are “cream of the crop” youth group kids. How do we make sense of this, and should we be alarmed? As a former youth pastor, those numbers do concern me. Realistically, just about everything our youth group teens know about Jesus came from what’s found in the Bible, so if they don’t trust the Bible, they can’t fully trust their own knowledge of Jesus. It seems to me that we parents and church leaders can do a better job of helping our Christian teenagers grow confident in the trustworthiness of Scripture. What’s more (and this surprised me), the data show that Christian kids who do have strong confidence in Scripture actually experience God more noticeably in their daily lives. For instance, four out of five (82 percent) teens who have “unshakable” faith in the Bible also report possessing “strong” proof that the Holy Spirit is active in their lives. Among kids who are uncertain about Scripture, that number is less than half (49 percent). For Christian teens who disbelieve the Bible’s reliability, only 22 percent (about 1 in 5) strongly claim real-life experience with Christ’s Holy Spirit. Christ’s exclusivity seems to be a big stumbling block for many teens. Fully 1 out of 3 (33 percent) of the Christian teenagers you surveyed believes that Jesus, Mohammad, Buddha and other great religious leaders all lead to heaven. Why do you think this is, and what are the implications? What’s hard about this finding is that these are Christian kids — teens who claim to have already trusted in Jesus for heaven (and more). In spite of that, they seem unaware that their answers to this question actually contradict their own Christianity — and the beliefs of other religions, too. Youth culture researcher Christian Smith calls this a “tolerance over truth” attitude that’s a result of mainstream, social indoctrination. There’s probably some validity to Smith’s opinion, but it’s always easy to blame the world outside for problems inside the church. Realistically, an enormous error in basic Christian truth like this one wouldn’t be widespread in our youth groups if adult Christians in our churches weren’t also embracing — and promoting — the fallacy. Tolerance and truth are not mutually exclusive — we need to be better at communicating both for our teens. What’s worth noting here is that belief in the trustworthiness of the Bible is directly related to belief that Jesus, alone, saves. Among “Jesus only” kids, 99 percent also agreed with the statement that “The Bible is 100 percent accurate.” The implication there is both encouraging — and obvious. 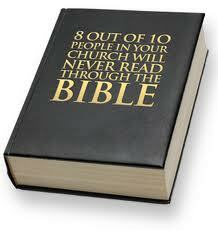 Barely 5 percent of those surveyed reported that they study the Bible on a daily basis, with 67 percent reporting that they seldom or never study Scripture outside church, numbers that reflect a downward trend in Bible study from similar studies conducted 10 years ago. How do you think we can reverse this trend and get young people excited about the Bible? Our first priority must be to help our Christian teenagers grow confident in the trustworthiness of Scripture. After all, why bother studying the Bible if its message can’t be trusted? If you can’t believe the Bible, then whatever it says is irrelevant. On the other hand, if the Bible can be trusted, then the Bible will be read — that’s my opinion. I don’t see Scripture needing any special ad campaign or “teen friendly” package. It already has within its pages everything a Christian teenager wants and needs in life. What our kids must come to know is that their Bible is real and true and trustworthy. When they come to grips with that, it’ll change everything — and create a hunger for God’s Word that won’t be denied. In the evangelism area, 84 percent said they believe Christians are “expected to tell others about Jesus,” while 56 percent said they actually did in the last month. Still, 56 percent seems pretty high. Are teenage Christians less afraid of evangelism than we think? This was another of the surprises of The Jesus Survey: Christian teenagers are actually quite open and unashamed about their religion. What’s more, talking about Jesus to their friends seems to come naturally for this generation. Even among Christian teenagers who say that Jesus is not the only way to heaven, more than half (55 percent) believe that every follower of Christ has a responsibility to tell others about Jesus “with the intent of leading them to be Christian too.” This unexpected openness about faith may be a benefit of that “tolerance indoctrination” our kids are experiencing in their society. After all, if all religions are tolerated, then it’s OK to talk about any religion — even when the topic is Jesus. At the same time, there is cause for concern about the evangelistic passion of our Christian teenagers. If the things they’re saying about Christ reflect what they actually believe about Christ, then (according to The Jesus Survey at least), three-fourths of them (74 percent) are actually spreading untruth about Jesus to their friends, neighbors, coworkers and more. What encouraged you most from the results of the survey? As part of the study, I was able to identify what I called “Confident Christian Teens.” This group of kids consistently and strongly affirmed each of the four core beliefs around which the survey centered. These kids were the minority in their youth groups (outnumbered 10 to 1 actually), but they reported a real-life experience with God that was identifiable and ongoing. For example, 94 percent of Confident Christian Teens strongly agreed with this statement: “I’m 100% certain Jesus has answered one or more of my prayers—and I can prove it.” Among the rest, only about half (55 percent) could say the same thing. Additionally, nearly nine out of 10 (86 percent) Confident Christian Teens strongly agreed with this: “I’m 100% certain that the Holy Spirit of Jesus is present and active in my life today — and I have proof that this is true.” Among all other Christian teens, barely half (52 percent) could make the same claim. For parents, youth group leaders, pastors, professors and others who care about the beliefs of the next generation, what are the big takeaways from this data? The absolute best thing you can do for any Christian teenager is to help that teen grow confident in the trustworthiness of Scripture. Teens who believe the Bible is reliable are more likely to embrace authentic Christian beliefs and — according to the data — are significantly more likely to experience an authentic, noticeable relationship with God. That’s the big takeaway I learned from The Jesus Survey. If you could summarize your overall assessment of the current generation of Christian teenagers in just three words, what would they be? Mike Nappa (’89) is a bestselling and award-winning author with more than 1 million copies of his books in print worldwide. He’s also the founding publisher of FamilyFans.com, “The Free E-Magazine for Parents” and a noted commentator on pop culture, theology, family and film.